Earlier today, the PTC article – Demystifying Cloud Services by Christa Prokos caught my attention. The article provides a good insight on different aspects of providing cloud services such as IaaS, PaaS, SaaS. The article is also connecting it to the notion of public, private, hybrid and virtual private clouds. It made me think about summarizing what I know about PLM vendors strategies and cloud capabilities. I admit that I don’t have full information and can rely only on public sources of information. So, I created the following draft table. If it makes sense to you, let me know. If you have some information and think I missed something, please comment as well. I will maintain updates to this post. What is my conclusion? In 2015, cloud is probably not a marketing differentiation for PLM sales people. However, the devil is in details. You need to get your hands dirty to figure out what “cloud” vendors are talking about. Earlier this year, at COFES 2015, I gave a briefing about PLM and cloud. You can take a look here to learn more. There are few questions that left not answered and, in my view, will require a heavy focus by PLM vendors – cloud adoption trajectory by manufacturing, economic of cloud offering and how cloud PLM can change an existing PLM implementation paradigm. It seems to me PLM vendors made a first shot to fill a spreadsheet with cloud check boxes. But jury is out to check what and how PLM cloud cloud can deliver. Just my thoughts. PS. The PLM cloud services comparison table is a draft. I’m looking forward for your comments – I’m sure missed some company specific points and I need your help to finalize it. I think it will be worthwhile to mention cloud services provided by Veeva systems. Our client needed a cloud based system to managed their documents and Veeva proved to be nice fit. Vivek, thanks for the link, but how Veeva is related to PDM / PLM products? I was at a nice CIMdata conference on the west coast for High Tech companies. One of the companies (Electronics Mfg) presented their use case on their selection process. He listed out cloud vs. non-cloud and referenced SaaS vendors. (Autodesk and Arena). There was no hint of hosting software being really a cloud system. People are smarter than the above graphic. I think eventually it’s just going to make vendors look silly when they talk about hosting as cloud. This fad will die in the next year or so. Brian, this is an interesting comment, thanks! I also have few follow up discussions related to offline comments on the same post. I have a question – what is your definition of SaaS? True multi-tenant software. Every customer on a single version. Zero on premise offerings (you can’t do both well… need to pick one and do it). Vendor takes on all costs of infrastructure. And all upgrades are non-disruptive and automatic. I would encourage you to separate the licensing model from the Cloud Service as this introduces a separate dimension that is difficult to portray on a chart as you have above. PTC has a three Cloud Offerings for PLM that all provide the service levels you would expect from a SaaS offering. PTC Cloud Services offers an SLA based contract with a commitment to availability of the application, system support for the application and the underlining platform, new release upgrades, customization and integration support, robust security model, and global access to data. 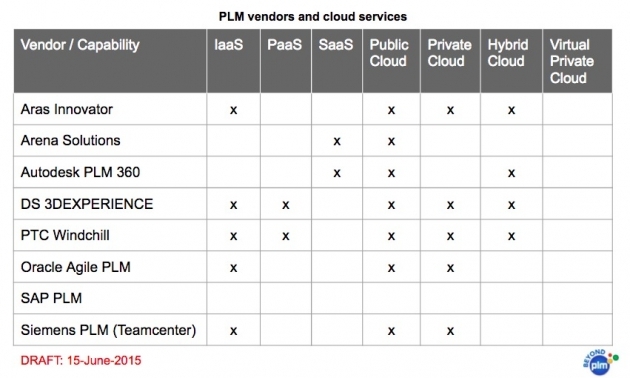 I would argue that PTC should have an “x” in the SaaS column for PLM but not for PaaS and IaaS. We agree with some of the comments below, the value in the service is a complete end-to-end support solution which an IaaS or PaaS contract does not provide.